Often, we talk about epidemics, infection outbreaks etc. The technology has advanced sufficient enough in past 10 years for us to efficiently track and come up with epidemiological pattern in a matter of days. Organisms are seldom talked in terms of species. Rather we prefer, to talk in terms of strains, sub-types, genotypes etc. With the ability to sequence an entire bacterial genome in less than a day, molecular epidemiology is a simple thing (Not really!! But compared to what was something a decade ago, it really is simple). Often you would read publications on genotypic epidemiology with fancy graphs and pictures. But how many of us have given thought on how to type? Basic question. For beginner's, lets talk first about a little basics here. The earliest of typing methods involve techniques such as differentiating based on ability to perform a chemical reaction, ability to grow in presence or absence of some important nutrient, ability to be attacked by a particular set of phages etc. It had a low resolving power. It cannot be used to differentiate a very close strain. With improvement in techniques, it was recognized that there are a variety of antigens which vary and hence used for typing. This was a classic method for a longtime. For example, E coli O:157 H7. These are phenotypes, which means based on phenotypic expression. 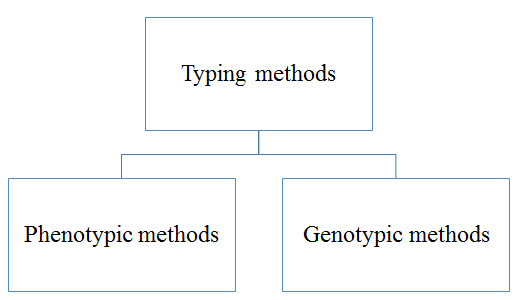 With improvements in genetics, genotyping was the technique of choice. You get an idea of the genetic code. Restriction pattern was one of the classic genotyping methods. The idea is that if the restriction enzyme cleaves at a particular site in the DNA which changes with strain you can get a pattern, discriminating enough. This technique is known as RFLP (Restriction Fragment Length Polymorphism). And then came the sequencing. From sequencing a single gene (Uni-locus typing) to sequencing several genes (Multi-locus typing) several mutations could be captured. More recently this has been expanded to include Whole Genome sequencing. But there is a large array of possible combinations in all the methods. Let's take a case. How did one come to decide that O and H are the antigens that needs to be typed? 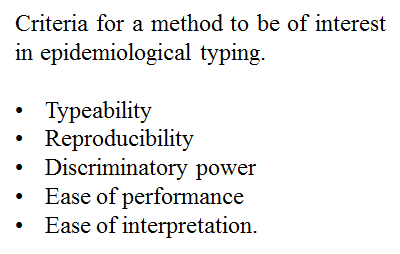 There are 4 important criteria that determines the use of typing method- Typeability, Reproducibility, Discriminatory power, ease of performance and interpretation. Here are a couple of considerations. I will use O-antigen as an example. But the rule extends to any method and its target. 1. The target which is to be typed is sufficiently variable. That means, if all the E coli is expressing the same antigenic "O", then it is not of potential target. 3. If there are 2 targets it should be resolvable. That means there are no confusing reactions. in other words technique should be able to discriminate between two different types even when they appear to superficially related. There are a set of strains called as "Untypable strains". There will occasionally be a strain that cannot be typed by one method. Such strains are called as untypable. For example, there are Spa-untypable S auerus strains. But they can be typed by other genetic methods. That means you have to select a target that has sufficient chance to vary but doesn't vary so often (Or lets simply call it stable). With genetic methods, there is an additional advantage of estimating evolutionary pattern and hence we can cluster the types and follow lineages. 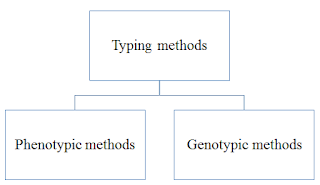 There is a very detailed discussion about the epidemiological typing methods in Microrao and recommend you have a look at it (Link). One more question. What is the point of typing. Isn't it enough to know the pathogen. There are several answers to this question. The first important point is, different strains have different pathogenic ability despite being the same species. For example, USA 300 which is a particular clone type in S aurues has higher pathogenic ability than some of its other counterparts. 0157 H7 strains of E coli are known to be notoriously pathogenic causing complications in comparison to other types. The second point is tracking. When there is a sudden increase in number of a particular case typing helps to track down the source of infection and also the pattern in which it is moving. By knowing these parameters it is possible to control these issue and thus reduce the spread of such an infection. Across the mammalian class the most common defense cell are the neutrophils. In humans these cells constitute about 40% of the circulating WBC in blood. Their function is to seek and destroy dead cells, pathogens and debris. They form a kind of first line defense against the incoming pathogens, long before any other specialized cells come into the battlefield. The neutrophils predominantly ingest the pathogens and subsequently degrade the pathogens inside their phagosome. Interestingly, certain pathogens have made use of this phenomenon. For example, Salmonella can sit inside neutrophils and avoid activation of phagosome thereby using the neutrophil as a free ride and a safe house. Pathogens are not something that are so easy to catch up with. Funny to describe it seems but at the scale of cells, pathogens can be slippery to catch and sometimes they may simply disperse and run. If you haven't seen the famous video of a neutrophil chase you must see it once. It was known for a longtime that neutrophils have a limited life span. Once the neutrophil has digested enough or has encountered pathogen, it will undergo self degradation. In physiological context, this happens at a very small fraction that we don't notice. But when scaled up the neutrophil liquefaction is so high that it forms a thick matter or what is known commonly as the pus. It was believed that the pus traps agents such as bacteria thus making it harder for the organism to run around. Till recently about a decade ago, it was believed that neutrophil functions at two fronts. 1st, they engulf bacteria and debris and kill the invaders intracellularly. 2nd, upon stimulation by inflammatory mediators they can degranulate thereby releasing molecules such as defensins which then acts as antimicrobial at an extracellular level. It is now clear that there is a third mechanism. It appears that neutrophils can throw up internal chemical contents with its DNA to form a netted structure to catch up the pathogens. In other words kind of throwing a net to catch the contents. In contrast to what was earlier believed this was not a passing event but a thoroughly regulated process. 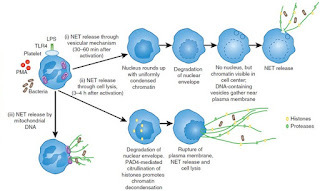 For lack of a better explanatory word, it was called as Neutrophil Extracellular traps (NETs) and the process came to be known as Netosis. 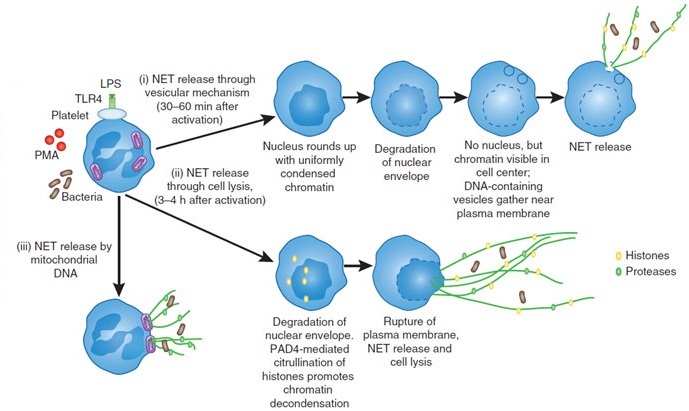 Precisely, NETs are networks of extracellular fibers, primarily composed of DNA from neutrophils, which bind pathogens. Careful analysis of the contents of NET showed that they contained molecules from primary, secondary and tertiary granules of neutrophils. Interestingly, these NETs don't contain cytoplasmic materials such as actin and tubulin. This is the first indication that the NET is not just the liquefacted neutrophil product rather a well programmed and directed effort to capture bacteria. Interestingly, more recently, it appears that other WBC such as eosinophils can also possess similar ability to form extracellular traps. Hence, the more recent nomenclature is "ETosis" to reflect extracellular traps. It is not clear on how exactly, the process starts. However, it appears that bacterial components and inflammatory mediators can kick start the process. For example, within 10 min of stimulation with S aureus, NETs are produced. The key molecule in the process is PAD4 (Peptidylarginine deiminase 4), a marker of Netosis. In brief, PAD4 causes citrullination of histones leading to chromatin opening. Other set of molecules dissolve nuclear membrane and opened chromatin forms a net-like structure. This is ejected from the cell (Like casting the net). The bacteria trapped is now immobilized making it easy for subsequent attack. Interestingly, content molecules of NET have antimicrobial molecules such as defensins and proteases. Further, the histone itself has been shown to have toxic property in very low concentrations. All this time the the neutrophil ghost cell is still there. (This is what makes it different from the classical liquefactive process). But most of the part of NET is interlinked DNA which forms the NET. Now you see the importance of DNAase produced by S aureus, and its importance in viruelnce. The DNAase allows the bacteria to escape from the DNA trap. Many other bacteria are also known to make DNAase which functions similarly. As already explained Netosis is a highly regulated process. Presence of DNA floating for a longtime around is not such a good thing. Once the pathogens are trapped, macrophages come into the picture and clean up. It is being theorized that improper cleanup of the process can lead to autoimmune conditions such as SLE where the antibodies are developed against DNA and (or) nuclear antigens. Formation of NET has been implicated in several infections and also in the process of disease. NETs probably have other roles that is yet to be deciphered. For example, In a recently published research, it was shown that monocytes with NETs prepared from cholesterol crystal-stimulated neutrophils induced a modest increase in IL-1β, whereas pretreatment of monocytes with NETs followed by stimulation with cholesterol crystals induced very good IL-1β secretion, suggesting that NETs provide the priming signal for cholesterol crystal-induced maturation of IL-1β in macrophages. Isn't that now an interesting story. In an average lifetime of an individual, what would be the average number of infections encountered is a difficult question to ask. None has a crisp answer. But if you had ask what is the most common infection that majority of the world population is likely to encounter, that had be a more easier question to answer. Of these, there are some viruses, that is encountered and a good majority of them is the Human Herpes group of viruses. One among them- Epstein Barr Virus (or just refer to it as EBV) has been of great interest. It is estimated that about 95% of the world population has EBV infection. Interestingly, less than 20% of them show any signs of infection. A portion of these show up with infectious mononucleosis (IM). EBV is a member of Human Herpes virus gamma subgroup (HHV-4). The gamma group of viruses are in general slow reproducers, often associated with lymphocytes and involved in long latency periods. The structure of EBV is a typical herpes. 85 genes, large enveloped virus. The virus can infect B cells and epithelial cells, though studies suggest that the preference is the B cells. 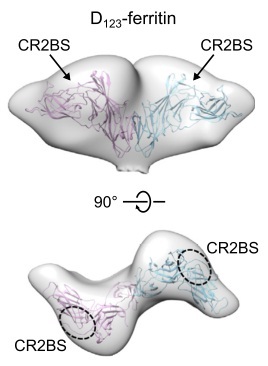 gp350 interaction with CD21 forms the cellular entry path. EBV can also enter CD21 negative cells via interaction with CD35 through viral gp350/220. In case of epithelial cells, the virus can enter the cells via BMRF-2 interacts with cellular β1 integrins. It has been suggested that there are several other alternate routes though there is lack of evidence. Apparently, EBV is transmitted from person to person via saliva which mostly is due to kissing (One of my teacher would joke about it saying it ain't a kissing infection rather a smooching infection). 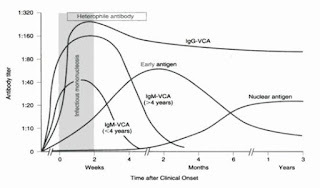 Immunologicaly, EBV induces antibody production. 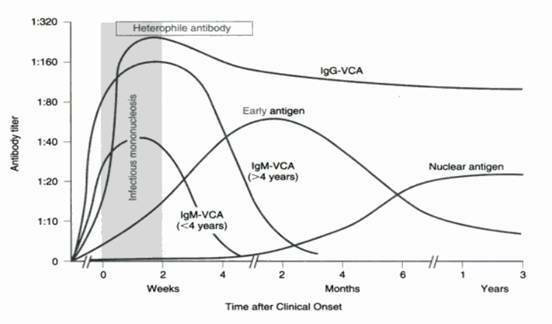 EBV produces different antigens at different time points of infection, and hence the antibody titre varies. The antibody response in these cases is of diagnostic interest. From the vaccine point of view, the best immune response would be blocking antibodies, one's which doesn't allow EBV cellular entry. There have been several vaccine tested till date on non human models. Most of the studies have not progressed beyond Phase I. Only one vaccine from the GSK has made it to Phase II. The vaccine is a GP350/AS04 containing Recombinant gp350 purified from the supernatant of Chinese hamster ovary cells expressing a gp350/220 gene construct with splice-site mutations that prevent population of the gp220 isoform (MSTOP gp350). The study had 181 volunteers. The vaccine had reduced IM by 78% but didn't prevent the primary infection. 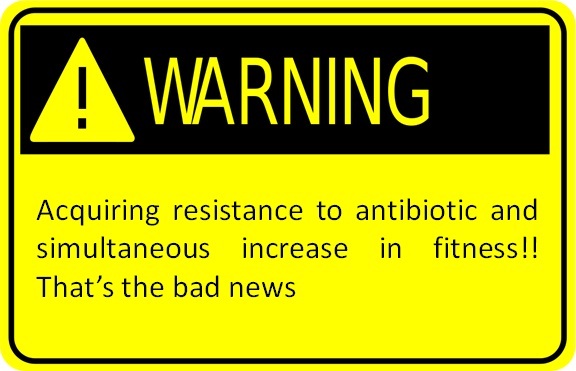 This is not a surprise, as I described there are alternative routes of infection. A new study by Nabel etal has used another approach. The team created gp350 containing nanoparticles as the immunogen. The basic construct contained ferritin or encapsulin stably containing D2H6O or D123 (truncated variants of gp350). These self assembling particles was then tested for its ability to induce neutralizing antibodies in mice and non human primate models. As can be seen from the paper, the response is quite remarkable. Further, the use of ferritin and encapsulin had stabilizing effect on the truncated EBV proteins which is a good news. At this point this is just another vaccine candidate. But that finding that this version was better than the soluble native version with potent neutralizing activity is encouraging. It has been questioned that what would constitute a ideal EBV vaccine. Of course the straight answer is 100% efficacy in preventing primary infection. However, considering that EBV in most people doesn't do anything much, a vaccine which protects well against the IM should be a good deal, at least for a start. Of course the best thing possible is not to ever kiss. More and more evidence has begun to accumulate in the favor of the idea that your gut microbiome has a lot to do with your brain health. It has also been the contention that there are at least a set of microorganism that can influence behavioral pattern. Something as complex as schizophrenia can have a microbial component attached to it (May not be evidence in every case). Toxoplasma is another example which has been debated in the literature. Isn't it fascinating to even think that some of the behaviors are influenced by the type of bacterial population sitting in your gut? Fig 1: Microbiome and eating habits. The story of microbiome influence on behavior is an old one. Gut bacteria influencing behavior has been predicted almost a century ago. It was believed that psychiatric conditions were due to intoxicating bacteria in the gut (Called as Auto-intoxication). The idea was considered so important that people had intestinal surgeries for psychiatric conditions, though later the practice was stopped. However, with the ability to study the entire microbiome that associations have become more clear. I have often pointed in this blog studies showing the role of microbiome with relation to weight gain phenomenon. Now more recently, an article argues that there is an influence of gut microbiome on eating habits. 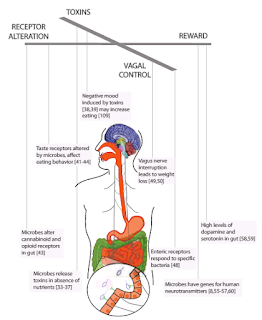 The idea is that microbes are manipulating through vagus nerve a craving to eat more. As Carlo Maley comments “Bacteria within the gut are manipulative. There is a diversity of interests represented in the microbiome, some aligned with our own dietary goals, and others not.” An illustration of the idea is shown in Fig 1, from the paper. One more interesting example. There is no second question on the influence of serotonin on behavior. So it doesn't come as a surprise that microbiome can be directly involved in serotonin regulation. In a paper from Hsiao lab, it was shown in a SPF (Specific pathogen free) mouse models that many different bacteria can make serotonin by associating with intestinal cells. 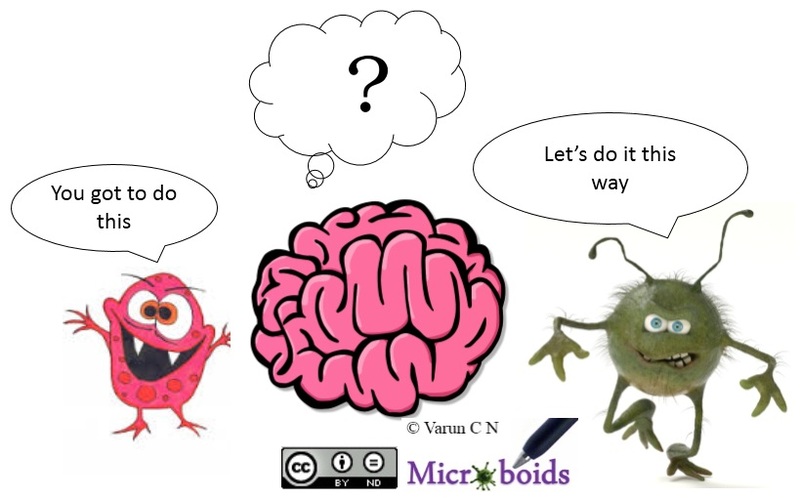 The understanding that microbes can manipulate the behavior has led to the idea of psychobiotics. Psychobiotics have been defined as a live organism that, when ingested in adequate amounts, produces a health benefit in patients suffering from psychiatric illness. It is clear that at least certain strains of bacteria, can produce or involve in production of neurotransmitters and chemicals that may directly influence brain development. For example, L. rhamnosus (JB-1) can influence GABA expression. It has been suggested recently that neurogenesis in hippocampus, a key region of brain involved in process of memory can be influenced by the microbiome. The field is naive and much of the details are lacking. I'm simply curious to know what other microbiomes (other than intestinal) can be influential. Perhaps we need a new field- "Behavioral microbiology". Considering that they type of food you eat determines the type of microbiome you have, "Food for Thought" is arguably a microbiology thing.